Wrap your elevator doors with your logo, advertisements, textures and more. How can we help you wrap your elevator doors? Its cheaper wrapping an elevator door and It looks better, too. Elevator wraps are a growing trend. It forces people to look at your logo, products and/or services. RM Wraps would help you wrap your doors. We will need your logo, images, measurements of the doors. If you want to use 3M DI-NOC vinyl, Belbien vinyl, click on these links. RM Wraps can provide you many different chooses. Wide-format printed images, solid color vinyl and 3M DI-NOC vinyl with a lot of textures, wood grains, metal sheen, and more. Average Cost is $160 to print out one door way. If you want to hire RM Wraps, contact us, and we will give you an estimate. Want to have a sample of the Air release vinyl - Matte sheen. Just tell us in the form. Average cost for Reusable elevator door wrap is $200 Photo tex fabric material - matte sheen. 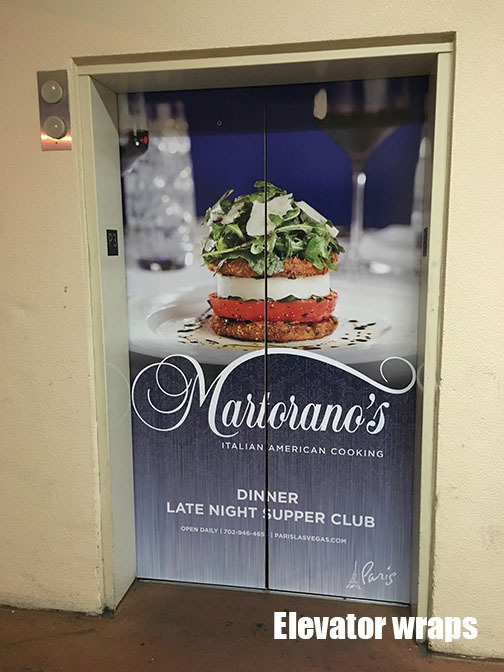 Average cost for long term elevator door wrap is $160 Air release vinyl - matte sheen. Average cost for short term elevator door wrap is $90 ( 36 x 84 ) Low tack vinyl - matte sheen. Made for Events, Promotional, expo Etc. Using Di-noc or Belbien Material on elevators walls and doors. Wrap your Elevator door with a vinyl wrap. High Performance Premium Cast With Air release Technology. Made from long-lasting outdoor sign vinyl. Our matte laminate creates a stunning finish to your elevator wraps and protects it from water, sun and oil. Designed to be easily cleaned and stand up to the heaviest wear and tear. If your looking for Di-noc or Belbien vinyl. There’s hundreds of Wood grain, Solid colors, Leather, Metallic and more to see. We do custom design prints all the time. What would you like to see on your elevator? Our passion is to come up with unique designs and make you elevator door and walls stand out. We look for your passions in life too. 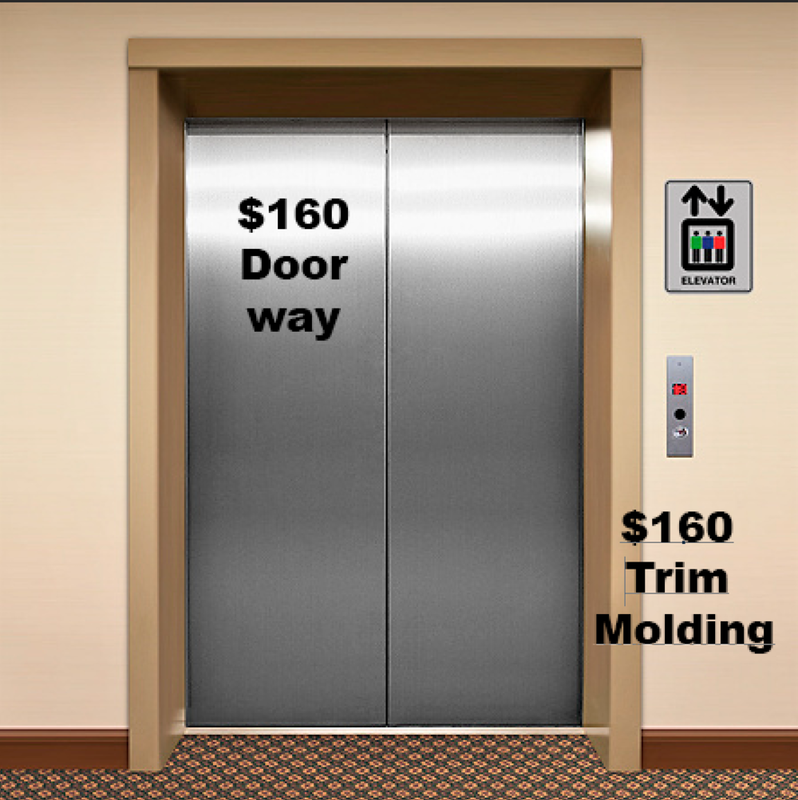 If you have a lot of elevator doors, elevator interior and trim molding. Rm wraps totally transform your elevator door and walls into the talking point of your office building. It’s an easy way to rejuvenate an elevator into looking better than new or simply adding some style to that old look! The beauty of vinyl wrapping your elevator doors and walls is that vinyl will stand up to the heaviest wear and tear without fading or coming off. If you decide to change your elevator wraps, up date the look, you can pull your vinyl wrap right off! It won’t leave any residue or damage your surfaces. How do you know your elevator wraps will stand the test of time? Because this vinyl elevator wraps is made from the same premium stuff companies use to brand their cars and make their outdoor signs. Once your elevator wraps is applied, you can be sure it’s not going anywhere unless you want it to. This little guy will stick and just keep on sticking! Want to take it off? No problem. This elevator wraps doesn’t leave horrible paper residue when it’s removed. Still not convinced? How about the fact that this elevator wraps is water, sun and oil proof. You can wipe your elevator wraps with household cleaning products without damaging it. Its colors won’t fade in the sun. If you really wanted to you could probably eat a salad right off it. How is that even possible? Because we coat your sticker in a matte-finish laminate that preserves its colors, protects it from damaging substances and enables easy, worry-free cleaning. Some people think that’s quality overkill for a sticker. We take that as a compliment. We love the look and feel of our elevator wraps and we’re not about to start compromising their quality. We have tons of different designs to choose from. Browse our shop to find your perfect match.